I received my BS degree from Trenton State College (now known as the College of New Jersey, Ewing Township, New Jersey 08618, USA) in 1973. From February 1977 to the end of June 2003, I worked as a full time mathematics teacher at Point Pleasant Borough High School (Point Pleasant, New Jersey 08742, USA). Throughout my years at this school, I taught several courses offered through the mathematics department: Algebra 1, Algebra 2, Algebra 2 Honors, Basic Skills Math, Computer Programming (BASIC), Computer Programming (QBASIC), Discrete Mathematics, Geometry, Geometry Honors, SAT Preparation. I received my MA degree from Georgian Court College (now known as Georgian Court University, Lakewood, New Jersey 08701) in 1983 after following the Supervision & Curriculum Graduate Program. I taught at Monmouth University (West Long Branch, New Jersey 07764, USA) as an adjunct professor (through the Mathematics Department) during three semesters (SP98, SP99, FA98) while still working full-time at Point Pleasant Borough High School. Due to a conflict with my full-time teaching position, I declined any adjunct teaching duties until several years later. After teaching secondary mathematics for more than 25 years, I retired from the Point Pleasant Borough School district at the end of June 2003. After taking some time off, I discovered that I was still in love with teaching mathematics. So, I asked to return to the list of adjunct professors at Monmouth University. 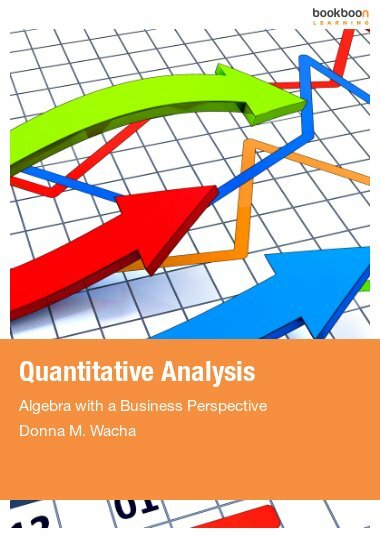 Always looking to expand my academic achievements, I agreed to compose an e-book for Bookboon.com during the latter part of 2012…the result being this tutorial e-book entitled Quantitative Analysis – Algebra with a Business Perspective.